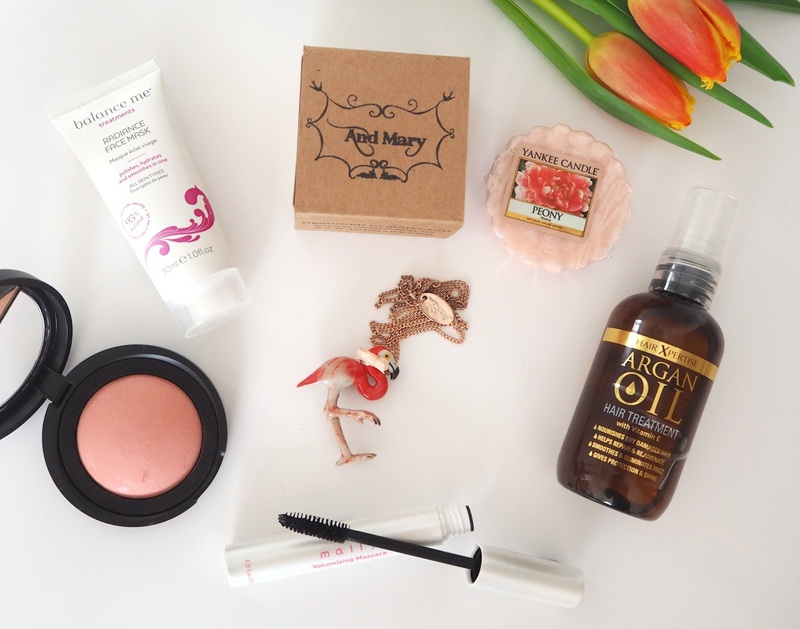 Argan Oil Hair Treatment | Right now my hair is suffering from dryness and bad split ends. It grows so dam slowly however that I'm reluctant to get it cut so I've been looking a little extra something I can add to my routine to revive it. 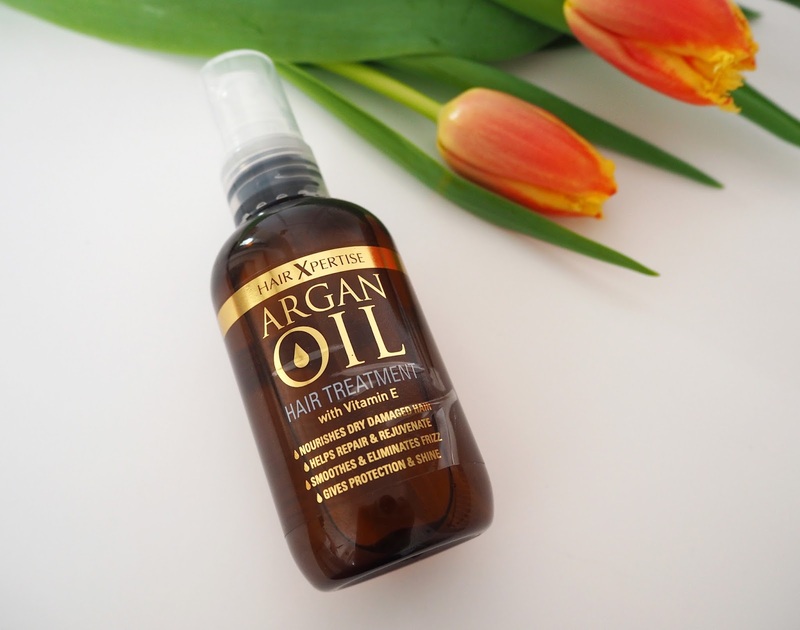 This Argan Oil treatment by Hair Xpertise is enriched with Vitamin E and has made such a difference to how my hair feels! My mum has also been using this as her hair is also super dry and unmanageable at the moment and like me has also noticed a positive affect. I just use 2-3 pumps on damp hair before blow drying. It has a fresh slightly fruity scent that I've been trying to pinpoint, I settled on fresh apple I think! My hair is softer, silkier, I don't need to bother straightening it and stays like that pretty much until I next wash it - winner! 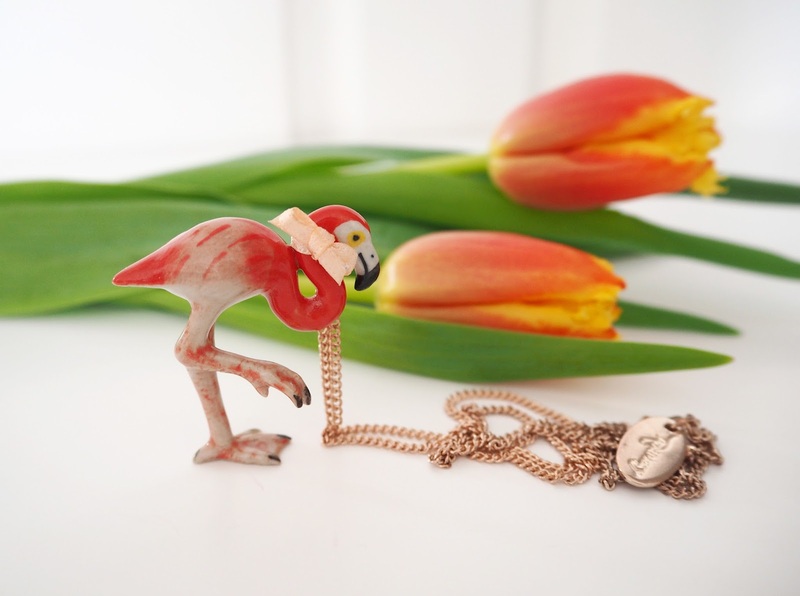 Flamingo Necklace | As you might have seen from my recent outfit post this necklace was a recent purchase from AndMary a company I had been eyeing up for a while. They make the cutest porcelain animal necklaces, my favourites are the woodland creatures and the new unicorns. So I'm very excited to finally own one and I wore it to the recent Brighton Blog Meet. Balance Me Radiance Face Mask | I actually got this as a freebie in last months edition of Glamour magazine and loved it so much that I've since bought another magazine just to get a second face mask! Considering the magzine was only £2 it was great value. I don't think I've tried a face mask by Balance Me before. 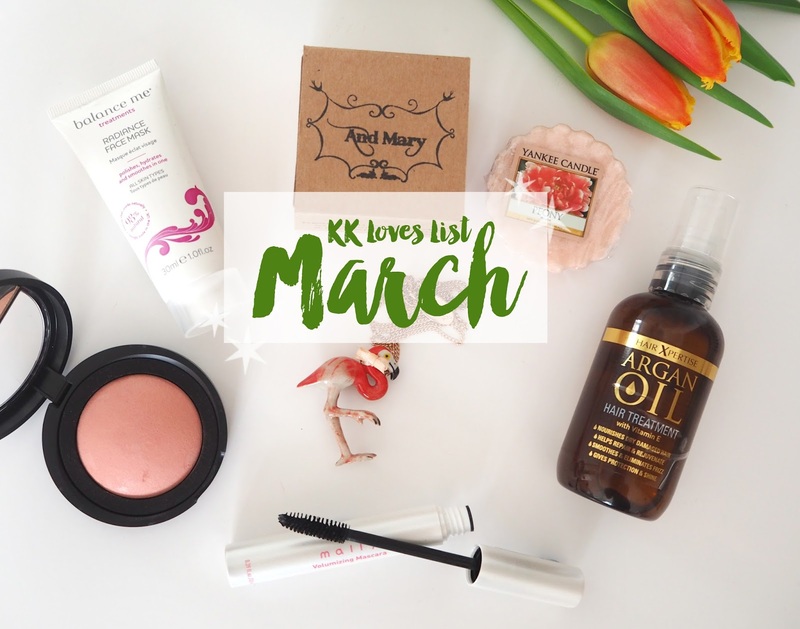 The texture is very creamy and softening with Kaolin Clay and has gently exfoliating walnut shells in it. The smell is divine and I think is the main thing that has me hooked, it's quite herbal, apparently it has lavender, rose, ylang ylang and rosemary in there. A great find that I will definitely be looking for in full size in the future! Peony Yankee Candle | “The rich scent of Spring's most coveted bloom, the peony, entices with notes of bright sweetness” This scent was brand new for Spring this year and it has already become a firm favourite in our house! I'm 2/3 of the way through a large jar of it and used up a couple of these wax melts too. The fragrance is like a light, floral spring bouquet with a little candy sweetness. It's a lovely one to have burning/melting throughout the house at the moment. 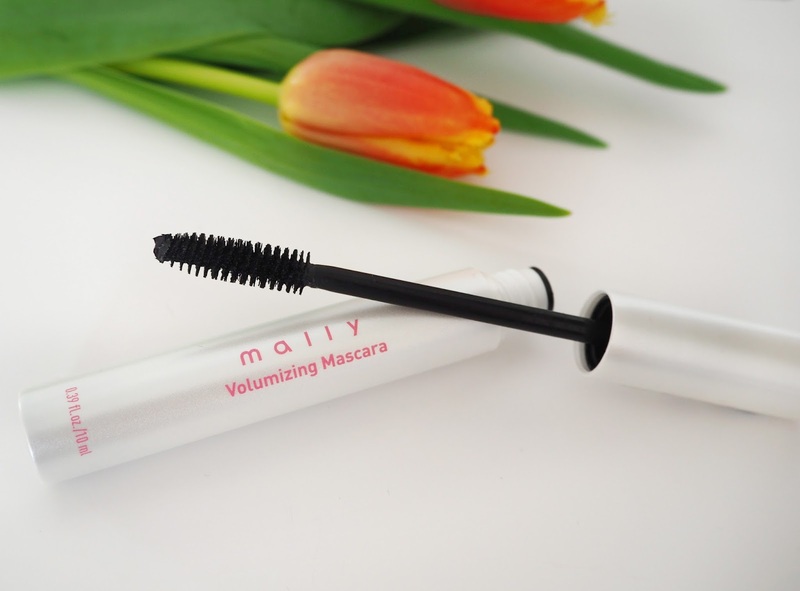 Mally Volumising Mascara | Mally Beauty is a brand I discovered through QVC UK and this mascara is one of the brands most famous products. I love this mascara it's one I always seem to go back to. It gives the longest, blackest lashes ever and I never find it clumps. It just doesn't disappoint. This one is almost always included in her QVC today's special values (TSV's) so fortunately I have a little stock of them! Buy a duo here or as a single here. I'm also a fan of Mally's Instant Impact mascara simply because the shape of the wand is awesome and I find really effective. I'm a good girl and always throw away my mascaras after 3 months of use, for the health of my eyes as bacteria can build up and you risk infections. So I only keep one on the go at a time usually. So right now I'm trying to decide which mascara from my stash to pick next! 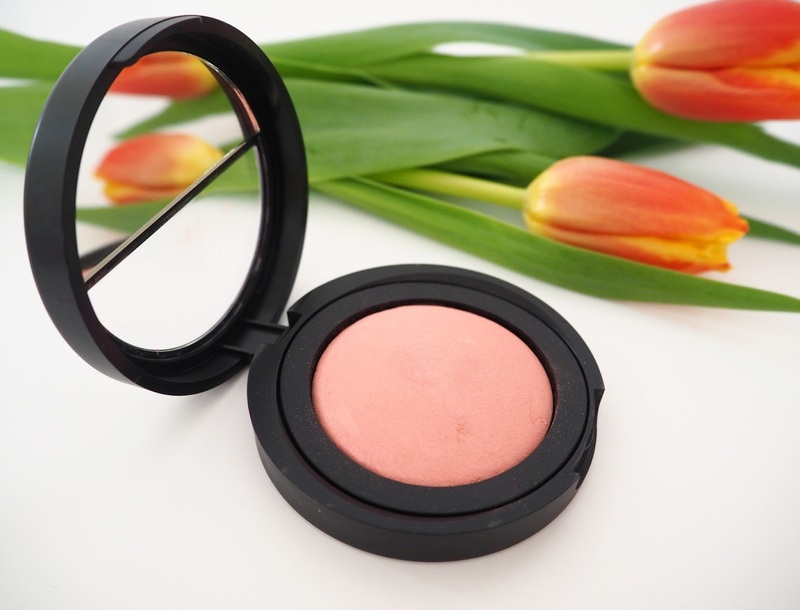 Laura Geller Bora Bora Blush | One of my all time favourite blushers is this baked Bora Bora shade by Laura Geller, another brand I first fell in love with via QVC UK. This is my go-to shade when is comes to blusher, if in doubt this is what I'm wearing! I love how it is a perfect balance between pink & peach so whatever shade of lip colour I chose to pair it up with usually works. I've already used up one completely and half way through a second, they do last a long time though. Like manly of Laura Geller's products, it's a baked cream formula which means it goes on like a powder but settles on the skin like a cream so it never looks cakey. This blush is build-able with a subtle sheen and I think works really well on my fair skin tone. I literally will wear this all year round but think that it is lovely for the spring/summer! I can't find that this particular shade is available on QVC UK but you can buy it here and here and also try eBay.